In the lab, we have been developing kits geared toward audiences eager to unpack the world of electronics and learn how circuits can become a part of their research and academic practice. The primary goal of theses kits is to enrich both the conceptual and material understanding of the relationships between people, technologies, and culture. 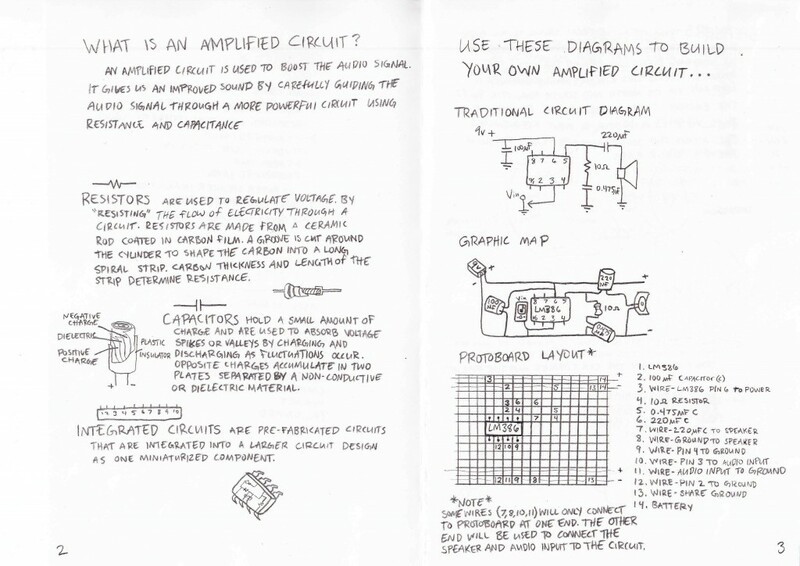 For instance, consider our “Introduction to Circuits” kit, the layout of which is much like a zine and includes instructions as well as the necessary materials to build a paper speaker and battery-powered amplifier. All materials are easily acquired and inexpensive. Also, the instructions can be circulated in paper or PDF form. Inspired by Shaun’s post on instruction manuals, our motive has been to not only define each component of the circuit, but to also simplify and give context for every step (graphically, wherever possible) in the most persuasive way. Our intent is that, through the kits, people will gain a foundational understanding of not just how a speaker works; they will also develop a sense of how circuits are designed and, more importantly, how and why each part of the structure is deemed optimal for the desired output (in this case, sound). Our hope is that people will be prompted to create their own circuit designs and question, complicate, or improve upon the principles outlined in the kits. Resonating in part with the aesthetic of Forrest Mims, this platform allows a given researcher to acquire an in-depth understanding of the principles of electronics and accompanying mechanisms. It also demands embodied activities that are difficult (if not impossible) to enact through screen-based interactions or symbolic logic alone. A speaker is an interesting subject for this kit for a few reasons, predominantly its simple analog composition. This territory was a good starting point for humanities scholars interested in circuit building. Some analog components of technology outlast digitization, whereas most have been gutted from contemporary electronic objects. Given that analog components are necessary to bridge the gap between humans and computers, they tend to remain on the outermost casing of technological objects. A speaker is one of those lasting analog components, as the functions of analog components have been reduced to human-computer translators. These are components that simulate and synthesize the human senses for the purposes of computation. For example, aside from speakers, consider the ubiquity of buttons and LED indicators in present day technologies. The simplified DIY nature of our speaker, which includes no pre-fabricated elements, allows people to not only participate in the build, but also—through a kit, its materials, and its inevitable limitations—fail, struggle, or get frustrated with the stuff at hand. This failure (or threat of failure), as well as the understanding that parts (not wholes) ultimately comprise the technological sphere, allows us to dismantle the assumptions at work in “black boxing” technologies. The amplifier was not included in our initial kit design, but its incorporation does two important things. First, it serves as a visible transition between the digital input of the audio signal (e.g., from an MP3 player) to the handmade speaker, and thus encourages a better understanding of the transfer of energy within a circuit. Second, it allows the participant to partake in physically building a multi-component circuit. It inevitably incorporates the principles of electricity, such as flow, resistance, electrostatic storage, magnetic fields, integrated circuits, voltage input, etc. The amplifier also introduces a less abstract approach to circuitry than the speaker in that it closely resembles the guts of electronic objects familiar to most people, solidifying (or so we hope) the link between themselves and the manufacturers of technological objects. Moreover, the kit allows people to play music from practically any audio player they have at hand, thereby acknowledging that circuit-building occupies a significant place in our day-to-day lives. 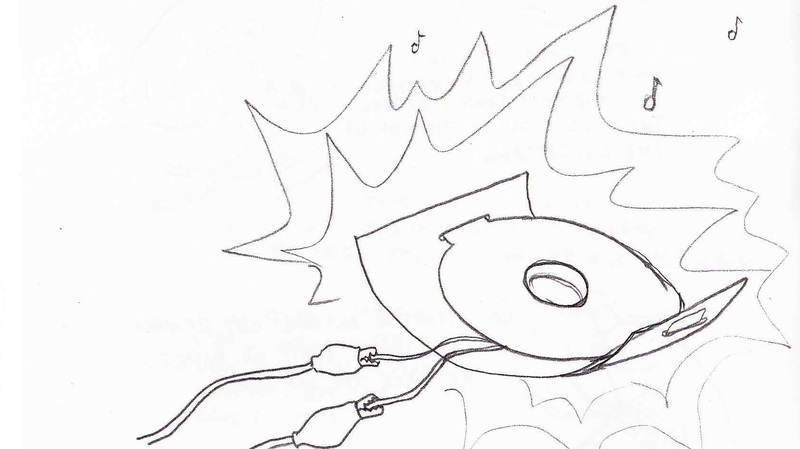 This element of the kit urges participants to retroactively consider circuit-building when, say, plugging a pair of headphones into an iPod or iPhone. In this way, we build upon—and even intervene in—people’s already congealed understanding of electronics, including their perceptions of how technologies influence their everyday life. How does the language of human-computer interaction (or network interactions) influence what tasks we delegate, or want to delegate, to electronics? How have our needs and desires shaped the development of this language and culture? How do the limits of materials demand adaptation? How has this adaptation affected the history of computing, the interoperability of electronic parts, and the ostensible obsolescence of technologies? Post by Katie McQueston, attached to the KitsForCulture category, with the physcomp tag. Images for this post care of Katie McQueston.